Two months ago, security forces arrested an Islamic Jihad terrorist in the city of Bat Yam, south of Tel Aviv, after he ditched his explosive device in a Rishon Lezion dumpster. An indictment filed against him this week revealed that the would-be bomber attempted to activate the device, which weighed 15 kilograms, while traveling on a bus from Jaffa to Rishon Lezion, but failed to do so due to a malfunction, apparently because the batteries were faulty. The Samaria military court ruled that 25-year-old Omar Ahmed Abu al-Rob of Jilabun would remain in custody until the conclusions of the criminal proceedings against him. The investigation material revealed that it was sheer luck which prevented the death and injury of dozens of Israelis. 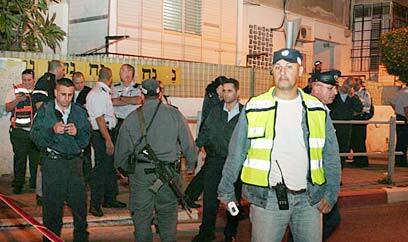 The terrorist made his way from Jenin to Tel Aviv via Jerusalem, taking advantage of breaches in the separation fence. The preparations for the attack were carried out comprehensively. Islamic Jihad members in the Jenin refugee camp filmed al-Rob carrying an M-16 rifle and reading his will. While he was being filmed, there was a sound of an aircraft, and the group moved to the local hospital. There, in one of the rooms, the filming was completed. A day before the bombing was scheduled to take place, the terrorist received a bag containing a device with an ON-OFF switch and batteries. He received orders that moving the switch to the ON mode would cause the device to explode. The terrorist took a taxi from the Jenin area to Ramallah, and then traveled by taxi to the Qalandiya area. He continued to an area where the separation fence was breached and entered Israel. He took an Israeli bus to Jerusalem, and then traveled by taxis to Tel Aviv. The entire time, he was carrying the explosive bag on his back, but the batteries were not connected. The investigation revealed that when he arrived in Tel Aviv, he got off the taxi and connected the batteries to the explosive device. The batteries were apparently inserted incorrectly, preventing the device from exploding. The would-be bomber took the switch out of his back and got into a taxi, looking for the right place to carry out the attack. He asked the driver to drive him to Jaffa. During the drive, he spotted a bus stop and asked the taxi driver to stop the car. In his investigation, the terrorist said that a "long" bus arrived at the stop, packed with passengers on their way to Rishon Lezion. He paid the driver and took a seat at the center of the bus in order to kill as many passengers as possible. The would-be bomber told his investigators that he began citing Koran verses in his mind, and then pressed the switch and moved it to an ON mode, but the bag did not explode. The terrorist did not give up and pressed the switch four more times. After understanding that a technical malfunction prevented the bombing, he continued to Rishon Lezion, where he got off the bus. He ditched the explosive device in a dumpster at a city park and called a friend living in Bat Yam, informing him that he was on his way to his house. At the same time, security forces received intelligence information and closed the entire Rishon Lezion and Bat Yam area. The terrorist arrived at his friend's house and the latter attempted to convince him to try and carry out the attack again by entering a restaurant with the explosive bag. However, it was too late, as security forces raided the house and arrested him. The investigation revealed that Abu al-Rob had been involved in a number of attempts to target IDF soldiers and Israeli citizens. See all talkbacks "Malfunction prevents major terror attack "